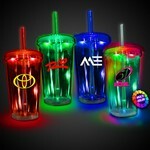 Represent your company with personalized drinkware. 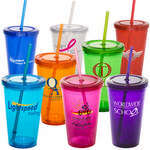 Choose from selection of plastic cups, ranging from tumblers, reusable water bottles, party cups, mason jars, sippers, and more. 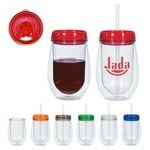 Our customizable plastic cups are BPA-free and are made from the highest quality materials. Reach great heights using 16 oz. 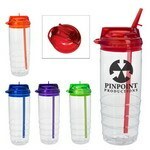 Everest Tumbler for your brand promotions. Use the 2 oz. 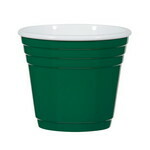 Mini Party Cup to serve small shots of beverages. The 20 oz. Riptide Tumbler has a unique design and an attractive appearance. Lift up the mood of your customers with the 22 oz. Mood Stadium Cup and watch them cheer your brand silently and their favorite team loudly when you present this cup at stadiums, before popular games. 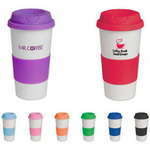 Make a presidential impact of your brand with the 28 oz. Reagan Bottle with Straw. Carry The Bev/Go 10 oz. 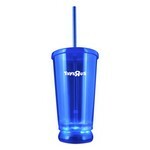 Tumbler wherever you go and enjoy your favorite liquids hot or cold. 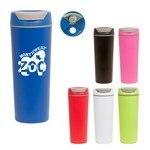 Our personalized commuter tumbler features a single logo imprint and comfort silicone grip. Our Customizable 5 oz. Clear Plastic Tumbler Cups can be imprinted in two unique colors. 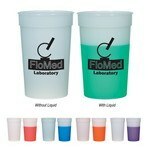 The Single Wall LED Tumblers w/ Straw and lid come with three LED functions: slow flash, fast flash, and still light. Sturdy Sipper is a 16 oz. 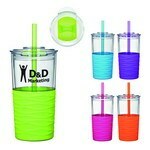 cup with straw that is made of BPA free, heavy duty double wall acrylic. The Vino2go 10 oz. 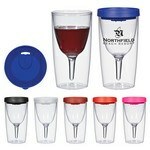 Wine Tumbler has an attractive design.